I’ve just finished reading a book that does exactly what it says on the cover, no more and no less. Which is quite refreshing in these days of media hype and rash promises. Sufficiently so, in fact, that I just had to tell you about it. 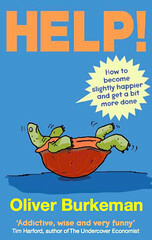 Subtitled ‘how to become slightly happier and get a bit more done’, Help! by Guardian columnist Oliver Burkeman brings common sense and scientific evidence to the world of self-help books. It guides readers through the maze of hyperbole and seeks out things that may actually be useful in our personal, work, social and emotional lives. There’s something in the book for everyone, no matter how organised, focused, gregarious or balanced you already are. Here are the eight things that I, for one, am definitely going to try to remember. 1. Goals aren’t always a good thing. We tend to set ourself specific objectives that we want to achieve (indeed, in many big companies, we have SMART goals forced upon us at every turn), but these can act as blinkers when it comes to recognising changes in the world around us or identifying interesting opportunities that may come our way. As Burkeman says, we can have a direction in our lives without obsessing about the specific destination. 2. You regret what you don’t do, not what you do. This pretty much says it all, really. So if you want to do something, just go out and do it. You’ll only kick yourself if you don’t. I can think of few things worse than reaching old age and thinking I’d wasted my life. Having no money and living in a box I could just about cope with, but regrets: not so much. 3. Cut people some slack. When we’re rude to someone or drive like a muppet, it’s because we’re having a tough day or because we’re in a hurry to get home. But when someone else behaves the same way, it’s because they’re an obnoxious so-and-so. Isn’t it possible, though, that they’re also a fundamentally decent person who’s also responding to less than perfect circumstances? So cut people some slack sometimes. 4. Meetings are (usually) the biggest waste of time on the planet. As Burkeman points out, meetings proceed at the pace of the slowest mind in the room. So all but one attendees are wasting large chunks of their time. If you have information to share, then write it down and email it to people. Only organise a meeting if you genuinely need people to bounce ideas off each other. Otherwise, don’t bother. Most people just want to get on with their work, not sit around and jabber about it. 5. Play to your strengths. People spend a lot of time trying to improve in the areas where they are weakest, but they’re only ever going to be mediocre at best. This is particularly the case in large corporations, where a uniform ‘skill set’ is seen as desirable. But we’re not uniform. Instead, why not play to your strengths? Take something you’re good at and get even better. And don’t care if you’re less than perfect at other things. 6. Don’t put off important tasks. When I have a large or important job to do, I have a natural tendency to put if off until I have a big chunk of time that I can devote to completing it. But you and I both know that this just isn’t ever going to happen. So the task remains not just unfinished, but unstarted. Burkeman’s response is to just get on with it, working on the task every time you have a few minutes to spare. Clearly, this won’t work with things that require a lot of set-up time, like painting the living room ceiling. But for most tasks it should do just fine. 7. Make collaborative decisions. Burkeman suggests a useful way for two people to choose between several options, such as which pizza to order or which film to watch at the cinema. The first person chooses five ‘potentials’. The second person narrows this down to three. The first person then picks the ‘winner’. This is great. My wife and I tried it last night when we were trying to decide which DVD to watch, and it worked a treat. 8. It’s OK to give up. We’ve had it drummed into us since we were kinds that once we’ve started something, we should see it through. But how many half-read books, for example, do you have lying around that weren’t as good as you thought they would be, but which you’ve convinced yourself you’ll finish when you get the time? Burkeman’s answer is simple. Just give up. Don’t do things simply for the sake of doing them. Instead, use the time to do something that you actually want to do. And take the books to the charity shop. This entry was posted in Books, Life, Thoughts, Work and tagged Books, Choosing, Giving up, Goals, Help!, Life, Meetings, Oliver Burkeman, Regrets, Strengths, Thoughts, Time, Weaknesses, Work by Simon Perks. Bookmark the permalink. #4 made me chuckle – how true and as a result I cancelled all my meetings today. They are after all the biggest waste of time on the Planet! Sounds like a good plan. I hope no-one took offence!